I've definitely been in a shopping kind of mood as of late, and the most recent thing to catch my eye is this really cute transparent raincoat from Storets (so very appropriate for rainy Melbourne!). I first came across Storets over a year ago via Chictopia and had quite a wish list I wanted to order from there. I never ended up placing an order though, so maybe now is the time to give them a try? Who has purchased from Storets before and would recommend them? Oh... Come on! That is too cute! oh my goodness! i think i might need to order this raincoat! i hope you don't mind, but it is so perfect! i have never ordered from them, either, but this is just too good to pass up! I've bought dresses from storets and I have had nothing to complain about. Everything shipped out pretty quick and the quality was great! Buy from them! I've gotten dresses from storets before. The shipping is fairly quick and the quality is great too! I love the idea of a transparent rain coat, and this one is definitely very cute! I wish the sleeves were longer though. wow thats a cute rain jacket!!! I lvoe it! WOW love that raincoat! Do you mind it i get it also? I just love it. I have never ordered from them before but the site seems ok. Free shipping which is always good! that is the cutest raincoat i have ever seen! Oh my gosh! I love this... Why hasn't anyone thought of this before aha! I need one of those! It's the only kind of raincoat I would wear. Love it. This thing would have been perfect in Sydney a fortnight ago. Loving the black piping. oh my gosh! that is so cute. when your raincoat is clear, it matches everything. great find! That is super cute! I've always wanted a raincoat that doesn't look like it belongs to a primary school child! In all honesty, if you had told me about a transparent raincoat I would have thought it was a little strange, but seeing it I actually love it! It would be fun to photograph. Oh Oh especially with paint! Now my brain is buzzing! 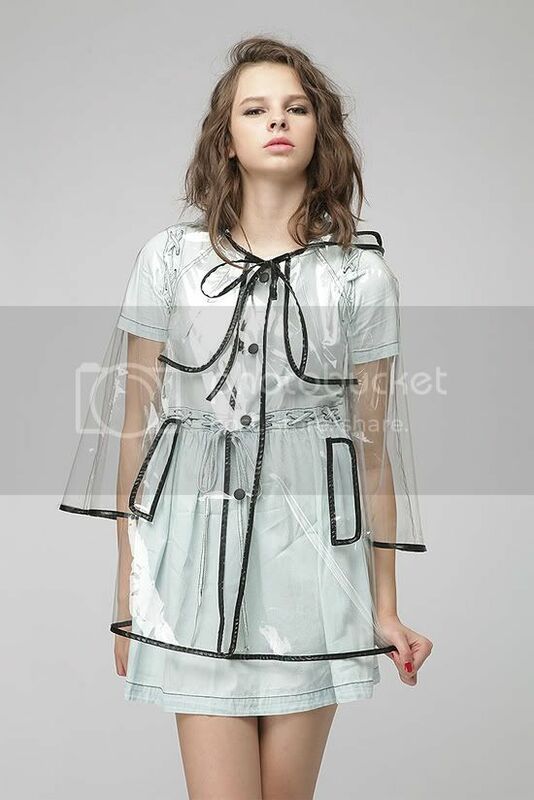 I wanted to the Topshop transparent rain coat when it came out SO BADLY but it sold out so fast! This may be an alternative?